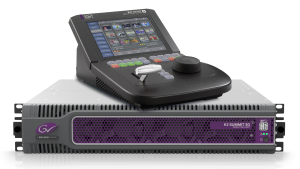 Grass Valley is set to do a major upgrade of the entire fleet of outside broadcasting (OB) vans owned by Alamiya, a media and advertising company in the Kingdom of Saudi Arabia, to enable the firm to deliver 4K UHD productions of major sporting and live events. The project with enable Alamiya to future proof its end to end live production infrastructure so it can keep its fleet of OBs – the largest in the Middle East – at the cutting edge of broadcast technology. As broadcasters face consumer demand for more immersive, higher resolution content, the upgraded OB infrastructure will allow Riyadh-based Alamiya to provide its customers with the flexibility to meet these demands. Alamiya has deployed hundreds of LDX 86NSeries 4K, HD, 3G Cameras, including 24 LDX 86 High Frame Rate HD, 3G, 4K UHD Cameras, the K2 Dyno S3 replay system and four Karrera K-Frame Video Production Centre switchers with three and five M/Es. Additionally, all of the related infrastructures, video routers and modular frames are based on Densité solutions. In addition, the LDX 86N provides the same familiar GV-eLicense upgrade path for the next level of functionality when production needs require it. Whether it is HD or 3X super slow motion today, 3G or 6X super slow motion tomorrow, or 4K UHD down the road, Alamiya will be ready to cover the top division of the football competition and other sporting events in Saudi Arabia.